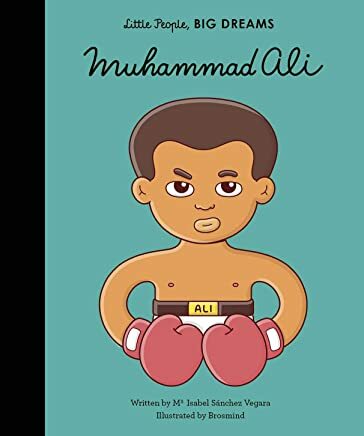 Muhammad Ali, written by Isabel Sanchez Vegara and illustrated by Brosmind is an inspiring addition to Frances Lincoln Children’s Books’ Little People, BIG DREAMS series. The short and accessible biography takes readers on a fast-paced and informative journey into the life of famous boxer Muhammad Ali. In addition to his boxing fame, the board book acknowledges Ali’s civil rights activism, conversion to Islam, refusal to fight in Vietnam, and post-retirement charity work. Like other books in the series, Muhammad Ali, provides enough detail to be engaging without overwhelming its young audience. I recommend this book for children between 2- and 5-years-old. This will make a valuable addition to personal and school libraries.